Guitar playing can be kind of hard sometimes, and sometimes you might have to think a little bit and try some stuff out for yourself to fully understand it. It can take some time. If you are a “I just play what I feel, and I don’t care to know what I’m actually playing” kind of player… this is absolutely NOT for you and you’d be wasting your money. But if you are willing to do a little practice, and maybe watch the videos a few times to really grasp the concepts, then I can tell you that this system has worked for many students of mine over the years and I’m sure it will work for you too. Modes Unleashed is a step-by-step, experience-based video course on how the Modes work, and how you use them on your guitar. What do I mean by experience-based, and what makes it different? But, of course, if that was all to it, then we wouldn’t be here. And If you’re reading this letter, chances are you’ve heard of modes, and maybe even had some experience with modes – but they just seemed weird and didn’t make a lot of sense. Now, when I was young and learning modes, I had all the time in the world to experiment with them and figure them out. It took hundreds of hours (if not thousands) but I figured them out and learned how they really work – not just what they are. And I’ll be the first to admit that experience is always the best teacher, so my experience-based course is all about giving you the right experiences so that you can quickly evolve your own mental model of what modes are, how they work… and most importantly, what they can do for you. The course consists of 13 complete video lessons, along with play along tracks, jam tracks, a complete manual with TABs and explanations – everything you’ll need to really understand the modes. Modes are just modes… it’s what you can do with them that make them amazing and useful. For example, using modes (and a couple of my handy shortcuts) you can quickly analyze almost any chord progression and figure out what key it’s in, and what mode will fit over it for soloing. So you don’t have to wonder or guess anymore, you’ll know. Modes give you all the notes, not just the ones that always work. That’s a double edged sword because it requires a bit of knowledge (which you’ll get, of course.) Without knowing how to use the modes, you can crash and burn. But with knowing, you can create ALL the sounds you hear in your head, not just the ones that fit in the pentatonic scales. Also, because modes give you all the notes, no melodies are out of reach. And be hearing all of those new sounds, you will recognize them in songs you hear every day. Imagine just playing through a scale and recognizing a segment of “Still Got The Blues,” or “Peace Of Mind,” or any number of incredible classic songs. That happens all the time with modes because so many iconic melodies are just scales at their root. And if you are ever looking to color outside the lines a little bit, modes give you the ability to expand your musical palette into outside sounds and more sophisticated soloing that you simply can’t do with pentatonic scales and blues scales. How to play each and every mode in the standard 2 octave shape. Before you can do anything, you have to be able to play the modes so, of course, we’ll handle that. My 2 foolproof ways to ingrain the modes into your fingers… How many times have you learned a scale pattern, only to realize when you are soloing that you didn’t know it as well as you thought? I have 2 ways of practicing the modes that will ensure you don’t get lost when it counts. How to move between the modes up and down the fretboard… because you don’t ever want to be stuck in just one small part of the fretboard – ever, when you solo. How to quickly figure out the key and tonal center of almost any chord progression… Modes need a little information to make them work, but with my 2 tricks to analyze any chord progression in just a few seconds, you will know exactly what will work every time. What do if the chord progression changes mode… There are 2 common situations where the mode changes, we’ll cover both of them with separate solo examples for each situation. How to play solos using the modes… With 8 complete solo examples throughout the course, you’ll have a library of phrases and ideas using all of the different modes. How to play 3 note per string versions of the modes for faster licks and runs… If you ever look at guitar players like Joe Satriani or Paul Gilbert, you’ll often see their fingers stretch out a bit to get 3 notes on every string. It’s not a huge stretch with modes and gives you a way to play much faster through your scales if that’s your thing. And if not, the 3 note per string modes also improve your mental model of the standard fingerings so it’s a win/win! The “characteristic note” of each mode… By knowing what makes a mode unique and different from other modes, you can assess instantly which mode fits a given chord when things go a little “off the reservation”. How to “bluesify” your modes when it makes sense… If you are a blues or classic rock player (or any style of music that is often blues based) then you need to know how to manipulate your 3rds to “bluesify” your modes. This gets rid of the sometimes blocky sound you get with the straight modes over blues, jazz, country, and blues-based rock music. Yes, that’s a lot of information and a lot of guitar goodness. Are you ready for it? 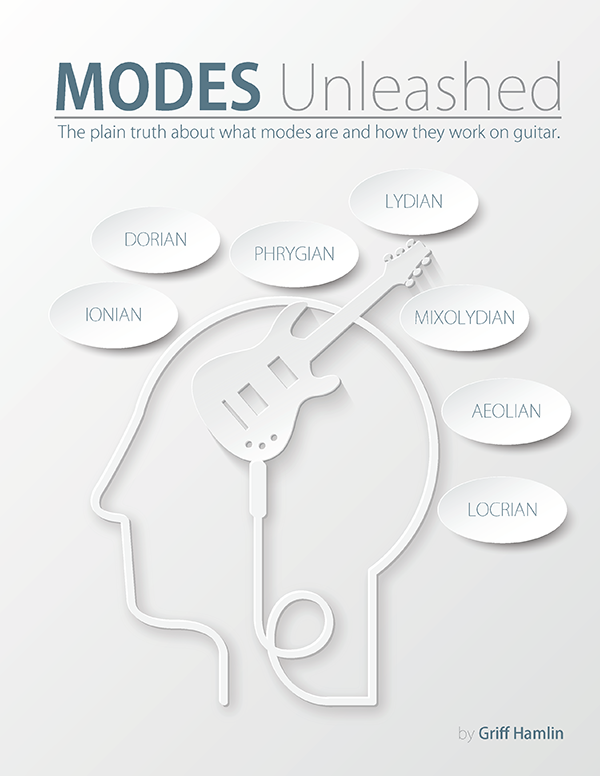 Modes Unleashed is a little over 5 hours of video content, plus all the jam tracks and play along tracks, and the complete manual which is about 55 pages long. 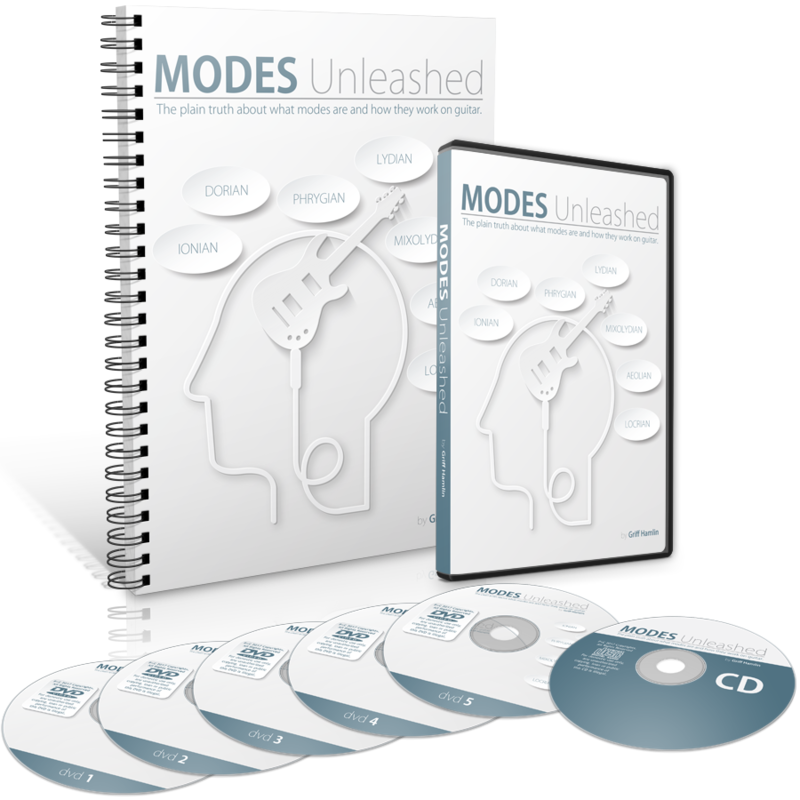 The cost of Modes Unleashed is $97 and you can access the courses right away in your secure Member Portal right after your order is complete – it’ll literally take like 20 seconds and you can be starting. Well, if not now... when? You probably don't wake up every morning thinking "I want to finally learn Modes today" so if you've always wanted to learn about Modes and add them to your repertoire, why not do it now while it's fresh in your mind. You'll be on your way to playing more melodically and understanding music, soloing, and improvising better in no time. To get your copy of Modes Unleashed just click the yellow “Add To Cart” button below with your preferred delivery method. 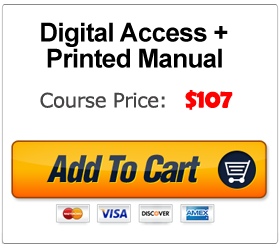 Within moments of your order being complete you will receive access instructions to the Member Portal via email. So you can be playing the blues in just a few minutes from right now! 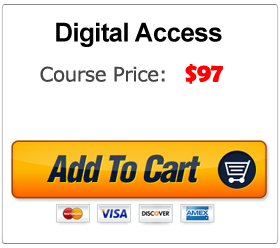 You can get my new Modes Unleashed course including a grand total of about 8 hours of video content, complete play along and jam tracks, plus complete manuals with TABs for every note for $97.